I've been using an instrument cable (1/4 cable for guitar) with my Elmo 16-CL to play sound through a guitar amp. It doesn't sound too bad, but I have to keep the amp master volume low and the projector's volume knob pretty low too. I've been meaning to buy a 20-35ft cable for a theater. After doing some research, there is a difference between speaker (high power, low impedance) and instrument (low power, high impedance) cables, even though they're both 1/4 cables. So should I be using speaker or instrument cables? Also, are there any projector speakers/amplifiers you guys would recommend? I've been wanting to get Elmo ones but they are always pricey on ebay. I like how my guitar amp allows me to adjust the treble, bass, etcetera. Should I look into getting a dedicated 16mm projector speaker (Elmo, Eiki, Bell and Howell, EV SX100 through a mixer?, etc.) or just stick with the guitar amp? Hi Scott...I use two small guitar amps for my speakers. 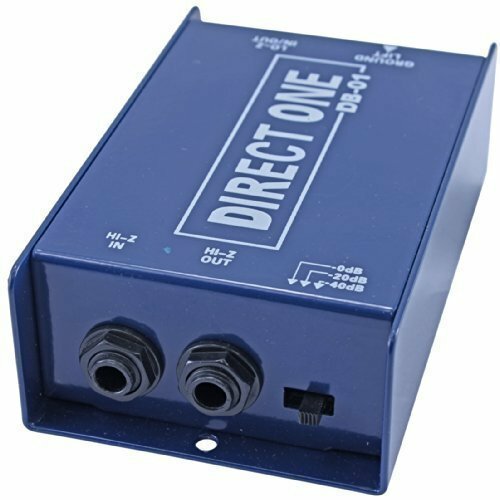 I recommend getting a direct box to connect the output of your Elmo 16CL and from the direct box output to your guitar speaker. The direct box will allow you to get your projector volume and speaker volume to more normal settings. Here is how I've introduced the direct box on my setup. Thanks Janice, some good stuff in that thread. So is this correct: I need to buy 1/4 speaker cables, not 1/4 instrument cables (https://www.fender.com/articles/tech-talk/why-instrument-cables-arent-the-same-as-speaker-cables). Also, since the amp in the projector is outputting a speaker signal, if I want to hook up the sound to a powered amplifier (like a guitar amp or other 8 ohm speakers), I should get a middle device like the Direct Box to knock it down to line level. I came up with this based on multiple forum posts, but I'm not even sure what line level means? Line level means a low impedance output signal suitable for earphones and the such, i.e., not for a loudspeaker. Can somebody tell me if I need to purchase a speaker cable or instrument cable (they are both 1/4 so I'm a bit confused and both work but obviously one is better suited for a projector-to-guitar-amp setup)? If speaker cables are low impedance and line level is low impedance (for like a powered speaker that uses 1/8 inch plug), then should I be using instrument cables (high impedance) for my Elmo since it is outputting a speaker level signal? Scot this is just a socket for an extension speaker, 8ohms 12watts according to the user manual, I cannot see a line level socket for this projector, so what you are doing is sending an amplified signal into your guitar amp, I don't think this is a good idea. Any full range 8 ohm speaker rated at 10 - 20 watts would be ample, most equipment shops that sell guitars or amps or disco equipment will have speaker cable to suit this, in fact a car accessory shop would have suitable cable. Don't buy gold plated oxygen free copper cable at $30 a foot, normal spec car speaker cable would be fine, connect this up to a 1/4 mono jack plug in, it will switch off the internal speaker you will now be able to control the volume from the projector of this extension speaker . In my opinion, the Elmo 16-CL with its internal speaker is quite adequate for use at home. However, as Paul says, any external speaker rated at 8 ohms would be suitable, and any twin cable (non-screened) can be used. Had you tried plugging in the speaker directly to your 16-CL? This little beast did have inbuilt amplifier hence speaker-output level. A small speaker should be enough for a small to moderate room use,which is actually its intended operation. I use "balanced" 1/4 inch cables for my speakers from my sound mixing/amp/console and also when feeding my 1000 watt rms pair of active P/As, etc. Always go the "balanced" way and I have run high quality sound with no loss over 20 ft plus per speaker. Correct or no? 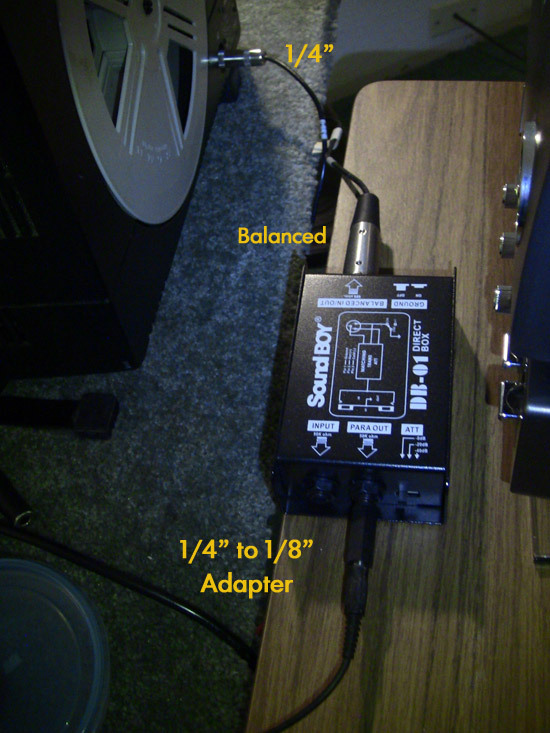 If it’s correct, should I get a long Balanced cable and keep the Unbalanced cable that connects the Direct Box to the Amp shorter because I read that Unbalanced cables start to have noise problems after 25’, and I need a lot of cable to reach the amp from the back of the room. This is all pretty complicated for me. Does that Direct Box have some sort of attenuation built in? The speaker out from Elmo would be sure "too hot" for most amplifiers. And since the output was unbalanced - right from the beginning,so I see no advantage making balanced connection in the route. 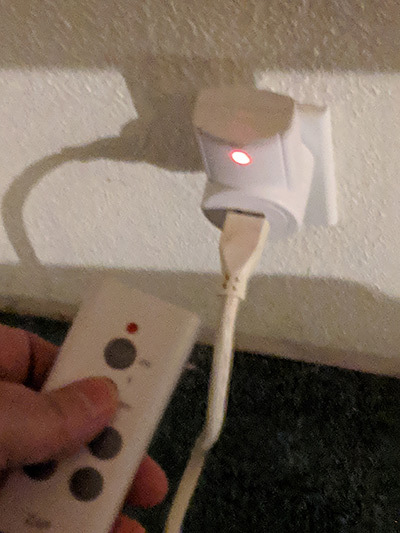 Again,I highly recommend connecting the output directly into the speaker using the projector's inbuilt amplifier part. give it a shot,that might be adequate for your requirement. Nantawat, I'm not using a speaker; I'm using a guitar amp. From what I've read online, the 16-CL is outputting a speaker level signal, whereas my guitar amp wants a line/instrumental level input. I've already been plugging a 1/4" TS cable directly from the 16-CL to the guitar amp and it leads to cruddy sound. I have to keep the volume knob on the 16-CL very low because I believe it is too hot for the guitar amp. Exactly that's why you need the audio attenuator to lower the level. Without that you'll have to lower the projector's volume to minimum (as you had already done),otherwise the sound will be so distorted. A simple passive attenuator made from a bunch of resistors should work just fine for this task. Thanks Janice. Do you recommend keeping the Direct Box's attenuator on -40db when using the 16-CL? I'm confused on one last thing. This quote explains how speaker cables (which look like regular unbalanced and unshielded 1/4" TS cables) actually take a low impedance, higher voltage signal (which is what the 16-CL outputs) and connects to a speaker. This would mean balanced TRS cables aren't the correct cable (however, they are low impedance so they still work I guess?). So I guess I should just stick with balanced TRS cables anyways? You can but shouldn't apply speaker level signals to 1/4" TRS or XLR cables and connectors. You should only use speaker cable (which has to large gauge stranded wires in it, and no shield) terminated with 1/4" TS connectors or Neutrik Speakon connectors or spade lugs or banana lugs or in the worst case scenario bare wires (don't use bare wires with high powered PA amplifiers). XLR cables are designed to carry a balanced audio signal. So basically your cable would carry the signal, from the source, to the speaker which in turn then amplifies it there. Speaker cables carry a load from amp to speaker, in which the signal is already amplified before it gets to the speaker. Totally different wire and they are NOT interchangeable. Speaker cable has 2 conductors (negative and positive) and balanced cable has 2 conductors + a shield. Yes 40db on the DI box or what ever gives you the best volume from your amp speaker. You can still tweak the projector volume to get it just right. I'm by no means an audiophile....but you are not connecting to regular speakers...you are going to a guitar amplifier with a speaker. So stick with the balanced/trs connectors and don't over-think it. It will sound fine. My projector is 15ft from my guitar amps and it sounds fine. I'm using a combination of balanced and unbalanced connectors so I get some hum...but generally the audio from the movie drowns the hum out. I'll revamp with all balanced connectors when I get a chance. So does the 16-CL's output acts like an external amplifier? For example, most external speakers are passive and require an amplifier to power them. So could the 16-CL power an external speaker like this? 8 ohm Speaker 400w From what Paul wrote above and the specifications, the 16-CL is designed to output up to 25watts. Could it even power a 400watt speaker like the one I linked? That speaker will DEFINITELY work. The 400w peak means that speaker can handle that much power from the amplifier,for a short period. At average it can handle 100w power pumped into it. Anything above that will burn its driver to death. Simply check the label at the projector's speaker output. If it is rated for 8 ohm speaker,there should be no problem using projector's amplifier driving it. In the worst possible case it would be simply underpowered causing faint audio label,burt nothing burnt up at least. Hi Scot...I don't know if you are still following this thread, but I thought I'd add one more suggestion. 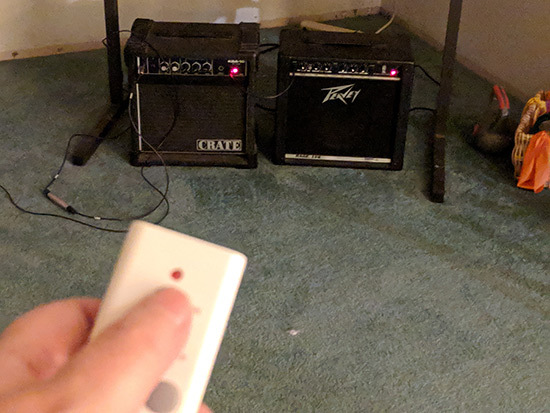 I have my guitar amps plugged into a remote controlled switch. This is so I don't have to go over and manually turn the speakers on or off. I like to turn the speakers off while I'm rewinding reels. Sometimes there is hum or hiss coming from the speakers which is annoying. I just use the remote to turn them back on when I start the next reel. Hi Janice, that is a great idea. I need to rig something up like your two-amp setup. So I bought a direct box and balanced cable for a showing I did and everything works, but unfortunately it is not noticeably different than just using an unbalanced cable straight from the projector to amp (though the attenuator does help bring the volume levels down a hair). I need to get a new guitar amp that isn't cheap and muddy,and hopefully that will help the sound. I'm also going to look at getting a dedicated 8 ohm speaker, but the lack of treble/bass control is dissuading me. You could always buy a Bell & Howell TQIII projector which has a built-in speaker, most models have bass and treble controls and a detachable side cover which contains two decent speakers. These, when plugged in, will mute the internal speaker. This probably won't help Scott, who may need relatively high amplification, but for years I was using a small Marshall guitar combo with Eikis, and I installed a jack socket in the back so that I could sidestep the amp. The projectors have treble and bass controls. In fact I've rarely needed additional amplifiction when presenting shows in small or medium-sized halls.